Respected journalist and historian, Colin Grainger, gathers vivid memories of the exotic aromas experienced by the people who lived and worked around the Royal Docks in its heyday. The Royal Docks area has a rich history in every sense – literally. We’ll often think back to the events of our manor and the sights we have seen. But the smells and tastes also leave memories captured forever in our brains. A candidate for the worst smell in the Royal Docks community must be The Rotunda. Or as most of us locals knew it and still know it – The Iron Lung. You had to catch your breath and have lungs of steel to survive having a pee in the Grade II listed Victorian cast iron urinal weighing over a tonne. It was used by generations of dock workers and pub goers, from shortly after World War II. The gentleman’s pissoir by CS McDowell is the only surviving circular public urinal in London, and was listed in 1983. People in Newham have wanted to know for nearly 25 years what happened to one of their local landmarks. It was said to have been admired by the Americans who wanted it as a tourist attraction. Rumours have also abounded that the circular structure had been demolished. But now the answer to the question: ‘Who has taken the pissoir’ can be revealed. It is still close to home. After the closure of the docks in the 80s it gradually deteriorated and Newham Council eventually sold it off to the now defunct London Docklands Development Corporation for £1. The body received bids from many areas for the pissoir, including interest from the USA. Back in the 60s, 70s and 80s, many London buses and indeed London Bridge was sold to the States. The Iron Lung stood outside the Connaught Tavern, now known as The Fox @ The Connaught bar. It disappeared in the early 1990s and was dismantled and refurbished at a cost of £47,000. Locals believed it had been disposed of. But it can now been revealed that it was transferred to the London Development Agency when the LDDC was disbanded. Many locals now believe it should be returned to the Newham docks waterfront, in the same way that the cranes in the Royal Docks have been kept as part of the landscape. This is a trend that originated in Australia when their former docks areas were redeveloped and has happened in East London and also Buenos Aires. A close second, and some may argue, possibly top in the awful smell stakes for me was the waft from the Ziff Meats slaughterhouse in Custom House. 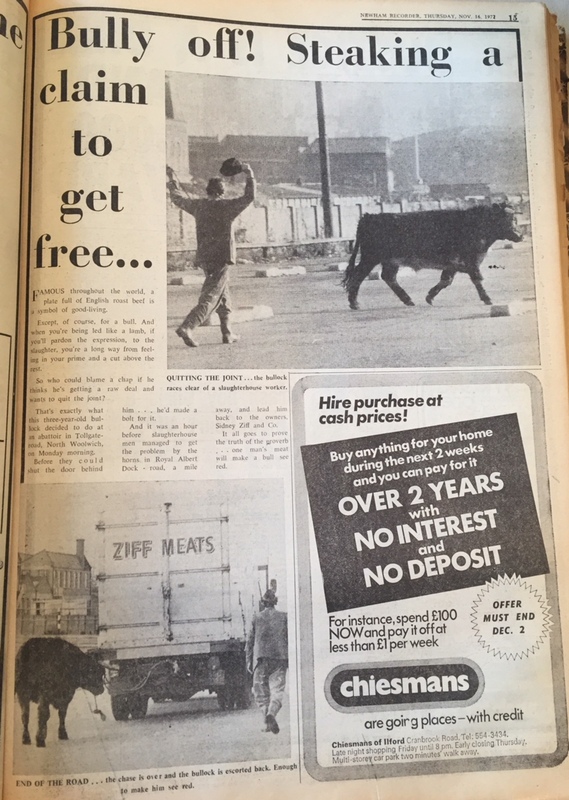 The firm dealt with meat wholesale and meat products and was registered in 1957 in Tollgate Road, on the borders of Custom House and Beckton. The smell could be sniffed as far north in the borough as East Ham and Manor Park and Plaistow and as far south as all of the Royal Docks neighbourhoods, Custom House, Canning Town, Beckton, North Woolwich and Silvertown… depending on the direction of the wind. Steve Harris, now in his 60s, from Custom House, said: “The smell was so nauseating. Made you want to throw up. Sometimes we would find some dead animal parts like bones or horns that had fallen from lorries.” Sarah Stevens from Barking said: “As soon as I used to drive up from Barking on the A406 the smells soon came up on you. Bob Cutting said: “Years ago the area used to be plagued by a really vile smell all over the place. It seemed to permeate everywhere. It was the abbatoir Ziff Meats and Jesus what a whiff ! It’s gone now but many a horse met with a very sticky end there as they used to render them down to glue ! In 1972 a bullock even escaped from the factory and produced a page of pictures in my first year at the Newham Recorder. Even though Ziff Meats closed in 1997, locals can still smell and almost gag with the memories of the aroma. 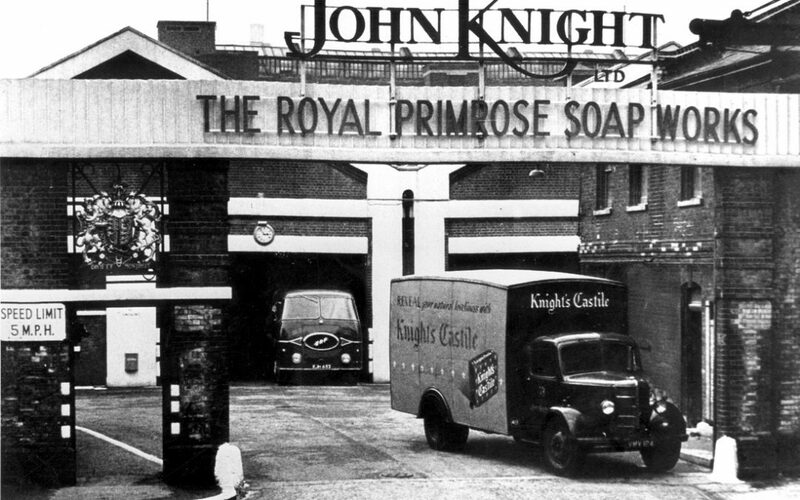 John Knight & Sons Soap Works was a family business that made affordable soaps, oils and candles for the working class. Plus, they supplied high-quality soaps to the King of England and the rest of the Royal Family. The company was founded in 1817 by John Knight who grew up on a farm outside of London. The soap business was family-run for over a century. In 2017, the company hit the 200-year mark. John Knight began making candles in 1810, then expanded to manufacture soaps and oils. In 1817, the soap factory began in Wapping – a 15-minute walk from the Tower of London. In 1880, the factory relocated to Silvertown. They used horse-drawn carts for distributing their products. By 1922, the company was an associate of Lever Brothers. By 1959, it was employing 1,200 people in Factory Road making soap, glue, tallow, fertilisers, vegetable and dripping. It was now a subsidiary of the massive Unilever organisation. But in Silvertown, we had to live with the smell. The smell was a big feature of my childhood in the 50s, 60s and 70s and by the time I was at the Recorder, it featured many times – and not always for the right reason. It wasn’t just my generation that had to live with the smell. One of the latest appeared in 2012, the animal waste factory was hit with a record fine after locals in Silvertown and West Silvertown in Britannia Village complained of the vile stench. The animal rendering plant was fined £120,000 and ordered to pay £66,000 costs – believed at the time to be the biggest ever achieved by a local council. During 2011, Newham Council received 300 complaints from local people. The company was found guilty of failing to properly prevent emissions of offensive odours beyond the factory boundary in breach of its regulatory Environmental Permit. It was their third prosection. Cllr Unmesh Desai said at the time: “Businesses should not be carried on at the expense of local residents. Our residents have the right to enjoy their lives in peace without a nuisance.” The factory moved to Dagenham in July 2017. One worker who did not want to be named said: “ I worked on the lorries collecting butcher’s waste. In the winter it was a good job. But in the summer the dolly bins were disgusting full of maggots and stinking.” He said he had four showers a day. Bill also pointed to the smell from the ship repairers at Harland and Woolf which could get down the back of your throat. I’d like to add one more personal memory. My late mother Lily worked at PR Chemicals (Printar Industries) in Silvertown as company secretary for many years. It was officially recognised as one of the most polluted sites in Britain many years later. Ships, workers and mail (hence my stamp collection – officially worth not a lot by experts despite having stamps from all over the world) – came from all over. Pollutants spilled out everyone. The smell was like nothing I had or have experienced. Choking, gasping, but you got used to it. When the firm closed and it was identified the site had to undergo about 25 different layers of decontamination by men wearing special suits on a site I had played on and where people worked. The numerous layers of concrete and such like were laid. And then the beautiful Thames Barrier Park with the view of the unofficial ‘eighth wonder of the world’ was created. The ugly duckling became a beautiful swan!